-This post is going to be long enough, so I'll give the mini-musings a miss for this one. But let me take a second to thank our Patreon sponsors, and encourage anyone out there to join in supporting our blog's efforts. -Also, special thanks to the folks at Wyrd, particularly Kai, who helped make this review happen. Since nearly the beginning of Malifaux’s time as a miniatures game, there was one recurring thread that would appear over and over on the forums: there needs to be a role-playing game set in this world. It has a rich background steeped in earth history and arcane lore. It integrates a number of genres that the fans of Malifaux and RPGs in general enjoy like Western, Gothic Horror, and Steampunk. It has a great story and vibrant, interesting characters. The only question was, how do we do that? What game system could people use to represent it? 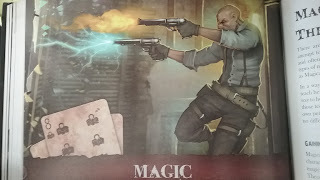 There were some Weird-West options out there at the time like Deadlands, but it was always more a matter of folding and patching the systems to make them fit rather than playing something designed whole cloth to feel like a Malifaux RPG. 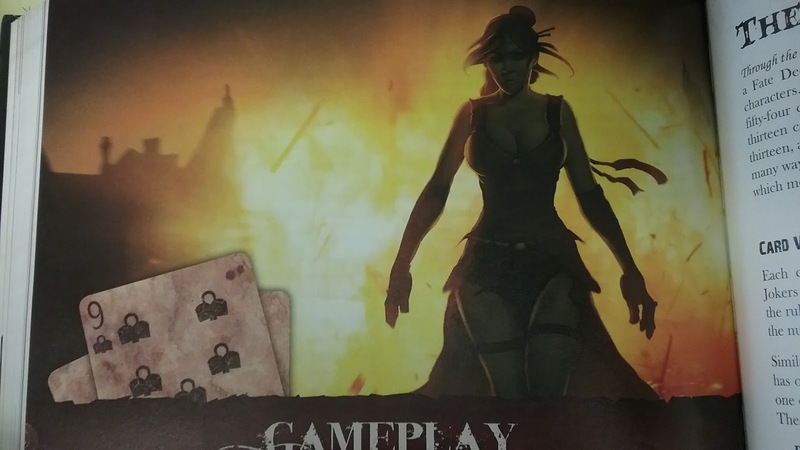 Then in late November 2012, Wyrd launched their Kickstarter for Through the Breach, a roleplaying game set in Malifaux based on the rules of the miniatures game. The goal was to make the games so compatible that you could port between the two freely, taking your characters to games on the tabletop or bringing any of the wargame’s rules or models into your RPG. It wanted to let you play characters that were reminiscent of the ones you used on the tabletop, be they spellcasters, melee specialists, ranged experts, or even everyday people like gamblers or workmen. It was ambitious, and like any effort to create something from whole cloth, there were bumps. Parts of the game worked well, but other parts fell short. While the general feel of Malifaux was there, the characters didn’t really feel like they had the same level of power or ability as even some Minion level Malifaux characters. At the same time, making things challenging for these characters was difficult as well, as the rules for accruing injuries and dying made actual character death a rare thing. And, like most 1st editions of games, there were rules that were clunky, awkward, or unnecessary. After creative control passed to the current head designer, Mason Crawford, some of the philosophy began to shift and newly created character options began to reflect the lessons learned from some of those earlier bumps. 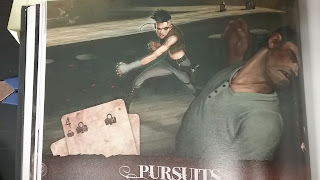 The character options presented in the Arcanist book Into the Steam, the Resurrectionist book Under Quarantine, and the Gremlin book Into the Bayou were better right out of the gate, due in large part to characters gaining new abilities when they first enter a character class (called Pursuits) rather than after completing the first session with them. However, introducing newer and more effective Pursuits made some of those presented in the original Fated Almanac feel underpowered enough to be borderline unplayable. And some of that rule and skill clutter was still there, bringing down what was otherwise a strong game. It seemed like it was time to go back and create an updated version of the rule set incorporating the lessons learned from the first trial run. Thus, the project that would become Through the Breach: Core Rules began. The final product is a tighter, more characterful revised edition of the original rules which is fully compatible with all published Malifaux products to date (a rarity in today’s world of new RPG editions) that I recommend highly. 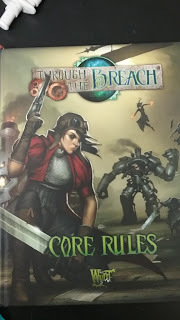 One thing that is obvious straight away is that Through the Breach: Core Rules is the first hardcover sourcebook Wyrd has published (at least, to my knowledge). It features a high quality matte finished look with a glossy logo that stands out on the shelf. After a number of readings and perusals I see no sign of damage to the spine despite the book’s weighing in at a hefty 415 pages, and it comes with a trio of attached ribbon bookmarks for tagging frequently utilized sections (two of mine are permanently placed on the Skills table and the Critical Wounds charts.) The art design for the book is for the most part consistent with other Malifaux products, with a number of pieces recycled from previous offerings but with an equal number of new pieces as well. The cover art features a battle between Witch Hunters and what are likely Arcanists or Outcast spell-casters and includes something that has not previously had a large presence in Malifaux outside of the Gremlins: a sense of wry humor. Namely, one of the Witchling Stalkers has been backhanded by the Hannah-esque suit of steampowered armor one of the rogue magic users is wearing and is flying backwards, wide-eyed with its weapons trailing behind it. This feels like a bit of a departure from the grimness that the setting can sometimes convey, but it manages to not go over the top and doesn’t dominate the rest of the book’s art. The one thing present in previous Wyrd publications that I do miss is the high quality short fiction, as this book has none. This is a mixed blessing, as it means there is more room in the page count for the detailed information contained within the book, and it also means the numerous revelations regarding the background and history of Malifaux are delivered directly rather than having to be cribbed from the short stories. But still, it almost doesn’t feel like a Wyrd book without them. 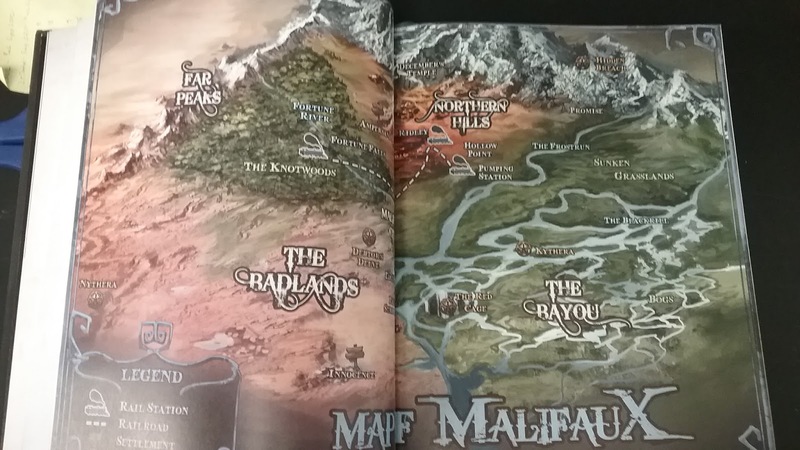 The first section of the book contains 56 pages of information on the world of Malifaux and its history. For those that are new to the world and have maybe arrived here after looking up reviews online, Malifaux is a game set in an alternate earth history. Events progress roughly the same as in our world until the end of the 18th century, with the variation that magic is a real thing but works about as well in this alternate Earth as it does in our real one because there just isn’t much of it here. 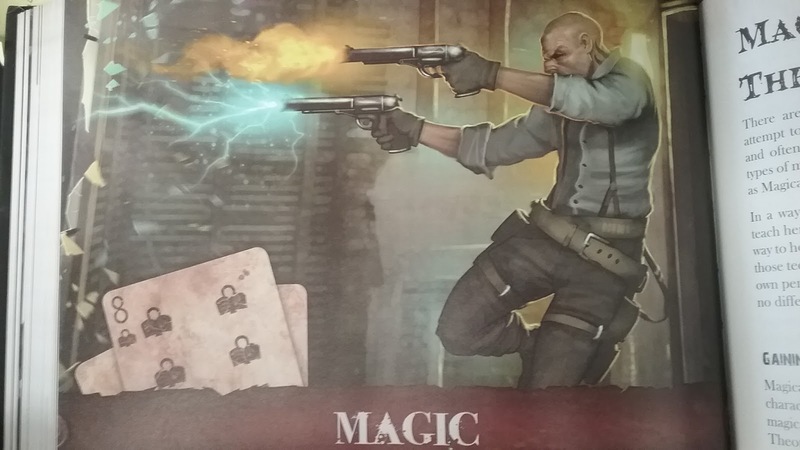 When the world’s magic users realize that the last of the magic is about to run out, they pool their efforts together and punch a hole into a parallel world, Malifaux, in search of a new source. What they discover is a place where magic flows almost tangibly through the air, where a magic user who could barely light a match on Earth can set an entire room on fire with their flame. And, best of all, they discover that the magic can be stored in stones called Soulstones that can be transported Through the Breach back to Earth, allowing magic to be used there as well. All was going well for about a decade, but suddenly the natives of Malifaux banded together, threw the humans back through the Breach they had opened between worlds, and sealed the portal behind them. The last thing to pass through the first Breach was a human body with the words “Ours” scratched into the chest, hurled through just before the Breach sealed. In the ensuing panic, the Earth is plunged into an early version of World War I, called the Black Powder Wars, as the great powers of the planet vied for control of the now limited resource of Soulstone. The result of this is the seizing of power by a collection of Soulstone dealers known as the Guild of Mercantilers (or Guild for short) out of the ruins of the cabal of wizards that created the Breach in the first place. This new power gains control of the world by seizing the global Soulstone trade in an iron grip. So things remain until about 100 years after the closing of the first breach when, spontaneously, the Breach reopens, allowing humans to once again travel to Malifaux. Prepared for trouble, the Guild brings a small private army with them, only to find the city once again sitting empty as was the case when the First Breach opened. Relieved, they nonetheless use the ever-present threat of Malifaux’s natives to establish a military dictatorship and monopoly controlling Soulstone mining and trade with Earth. They are opposed by rebels called the Arcanists who resist their efforts to control the study of magic. Meanwhile, the humans who have travelled through the Breach to try and make their living in Malifaux are constantly menaced by necromancers called Resurrectionists and the various natives of Malifaux, including the Bayou pests known as Gremlins and the nightmarish Neverborn who twist the human’s fears against them. And in the shadows of it all, a Far-Eastern crime syndicate known as the Ten Thunders slowly spreads their influence through all the other factions, quietly stealing power and wealth for themselves. The background section next discusses the city of Malifaux itself, former capital of the Neverborn which is now occupied by the human forces. It goes into a great deal of detail regarding each of the districts of the city, including the well-developed Downtown district where the Guild keeps their headquarters, the Slums where most of the city’s people try to eke out a living, and the Quarantine Zones walled off by the Guild that serve as sanctuaries for The Guild’s enemies. This section is dripping with potential campaign or adventure hooks. It then goes on to describe some portions of the world outside of the main city in slightly more general terms, as much of this material is described in greater detail within the other Through the Breach sourcebooks. Finally, the background chapter finishes up by offering information about the seven factions operating within Malifaux, including some new revelations regarding the early history of the Miners and Steamfitters Union that the Arcanists use as their front, the methods by which the Ten Thunders rose from humble street gang to become one of the most powerful factions in Malifaux, and some information regarding the true form of Lillith, leader of the Neverborn vampiric-creatures known as the Nephilim. The next six chapters detail the numerous character options offered in the book. As with the 1st edition Fated Almanac, the only character race available is humans. Options for playing undead, gremlin, or partially cybernetic characters are presented in the other sourcebooks. Presumably, players who want to play as Neverborn will be able to do so once the appropriate book is published at some point in the future. This section begins by detailing the very unique method of character generation used by Through the Breach: performing a Tarot reading that simultaneously provides you with information on your character’s background, skills, and attributes as well as spelling out a Destiny for your character to embrace or resist over the course of the campaign. This Destiny serves both as a source of plot hooks for your gamemaster (called a Fatemaster in TTB) to use, as well as a means of character advancement, as the most potent increases in abilities for your character will come when they face part of their destiny. Once all your players have completed their destinies (presumably in one big-blow out final adventure) players are recommended to wrap up that campaign and start a new one with new characters. One consequence of this is that Through the Breach campaigns are, by their nature, more linear and limited than what some players may expect from other RPGs they’ve played. While not impossible, a sandbox style game where a Fatemaster simply drops his players into the world of Malifaux and turns them loose to see what happens is more challenging than one with clear adventure hooks, follow-up, and resolutions. I like to think of my TTB campaigns as being episodic, very much like a western like Gunsmoke or Bonanza with a cold-open prologue that gives the players an idea of what’s coming for them in that game session, the meat of the adventure itself, and an epilogue that wraps up some of the action and possibly sets up the next episode. Next, the book details the various Pursuits which Fated characters can follow over the course of their adventures. The fourteen basic pursuits available in the Core Rules cover a number of roles in the world, ranging from Dabblers who craft magical energy to produce powerful spells, Tinkerers who animate robotic constructs to serve them, Gunfighters, Mercenaries, Gamblers, Performers, and even every-day laborers like Drudges and Pioneers. One of Through the Breach’s most unique rules compared to other RPGs is the ability to choose which pursuit your character will be on at the beginning of each game session based on information presented in the game’s Prologue. To help encourage switching, each Pursuit includes a Rank 0 talent which Fated characters receive when initially embarking on a Pursuit, allowing even new characters to have a taste of the flavor inherent in each. 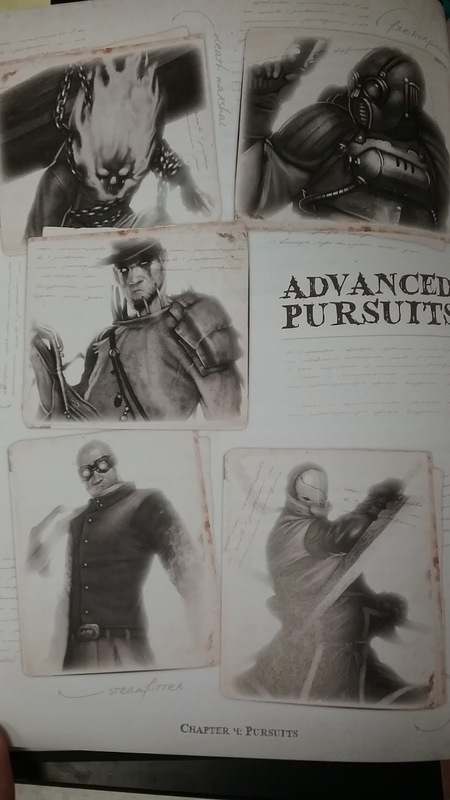 Additionally, the book contains five Advanced Pursuits: the Death Marshal, Freikorpsmann, Grave Servant, Steamfitter, and Torakage, giving your character the ability to become a member of some of the iconic organizations in the world of Malifaux. Next, the book details the skills your character will use during their adventures. Almost everything you do in the game involves flipping a card from the Fate deck and adding your ranks in a skill and a relevant attribute (the equivalent of Ability Scores from other RPGs) to overcome the various challenges and obstacles put in their path by the Fatemaster. The list of available skills is the same as in the previous edition of Through the Breach with some trimming to remove and consolidate some of the redundant skills together (a sidebar includes information on which skills should sub for some of those that were deleted out.) One addition to the Core Rules is the inclusion of skill triggers, bonuses you can use for skills with which your character is particularly adept based on the suit of the card you flip from the Fate Deck (explained in more detail later.) Every character who gains three ranks in a skill becomes eligible to add a trigger, and each skill has an example trigger listed in the book for each of the four suits. His skill trigger is: Come at me, bro! Following the skills, the next chapter details Talents, abilities that further help to flesh out and define your character. One of my favorite parts of the original Through the Breach was the inclusion of a number of talents that require you to have a poor score in one of the game’s core attributes, representing means your character has developed over the course of their life to get around some of their deficiencies. 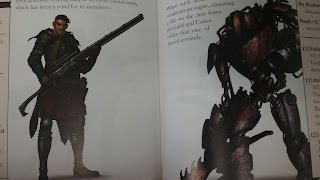 Next, the equipment chapter contains a much more concise list of the various weapons, armor, prosthetic replacements, and gear available to Through the Breach characters in the Core Rules. While I appreciated the numerous historically accurate options for, in particular, the guns in the first edition of TTB, trimming the lists down makes it a lot more useable and removes a great deal of redundancy. If someone has a particular antique weapon they’d like to see represented, they can always just reskin one of the guns presented in the book and say it’s the one they prefer. I think it was a great change. "I cast Magic Missile at the Darkness"-A thing that can actually happen in a TTB game. Finally, the Magic chapter describes how Fated characters are able to manipulate the magical energies available within Malifaux itself. Magic use in TTB is not limited to characters from one of the magic using pursuits (though they have the easiest time getting into it.) Each character who uses magic must acquire a magical theory detailing their means of accessing these energies. Some of these are familiar to players of the Malifaux miniatures game, including the Oxford Method used by some Arcanists, the Whisper that teaches necromancers to raise the dead, and the Thalarian Doctrine used by the Guild to suppress other forms of sorcery. Others are unique to Through the Breach (at least as far as I’m aware.) The Lifewell Doctrine is a theory that enhances a character’s ability to use restorative magic at the cost of their ability to use magic to do damage. The Darlin theories (named, presumably, with a tongue-in-cheek reference to Aaron Darland, head designer of Malifaux) focuses on animation of mechanical constructs. The Balanced Five is focused on the balance created by the five elements in Malifaux (Air, Earth, Fire, Metal, and Water) and creates magical effects by throwing this balance out of whack. Additionally, magic use for the Core Rules characters involves the acquisition and utilization of Grimoires, which can range from your traditional spellbooks to the writings of madmen on sanitarium walls to a special magical shovel that whispers the secrets of the spells to its wielder. Spells themselves are crafted by the players by combining Magia, the base spell effects, with Immuto, modifiers to the spells that allow for the alteration and manipulation of the magical effects to increase their range, change the types of creatures they can target, cast them faster, etc. etc. etc. Each Grimoire contains a selection of Magia and Immuto with which the Fated character can craft unique spell effects on the fly during the game, at the cost of making them more difficult to cast for each positive modifier they tack on. Finally, the magic chapter discusses Soulstones, the reason humans are in Malifaux in the first place. The rules for these are very much trimmed down from their previous iteration. Soulstones are given a Lade based on their size and clarity which affects their monetary value, but ultimately the only effect this has in game is to increase the range at which they can be recharged by someone’s death. Otherwise, each stone carries one charge which can be used for specific functions: augmenting the casting of a spell or manifested power, animating magical constructs for a number of weeks equal to the lade of the stone, or healing the bearer. It’s a vast simplification, and Tinkerers and Graverobbers in particular will miss being able to use stones that would recharge faster than their creatures would consume them in order to keep their creations alive into perpetuity, but I suppose sometimes sacrifices must be made for the sake of clarity and ease of use. The Core Rules contains all the information one needs to run a game of Malifaux, combining all of the material that previously would have been found within the Fated and Fatemaster’s Almanacs. As previously stated, the rules for Through the Breach are based very closely on the Malifaux miniatures game. All interactions are resolved by flipping cards from a central deck of cards, the Fate Deck. The number flipped on the card plus a modifier from the character is compared to a target number set by the game’s Fatemaster to determine success or failure. If a situation delivers particularly positive or negative circumstances for the action, players receive + or – modifiers and flip additional cards to reflect this. And, much like the miniatures game, players are not stuck with the result of the card flip. After generating their characters, players build a 13 card Twist Deck that they can use to replace cards flipped from the Fate Deck, allowing them to Cheat Fate and seize control of their own destiny. Since everything is done with static target numbers, the FM never actually flips any cards, as resisting attacks or effects delivered by non-player characters (or Fatemaster Characters) is done instead by the players (Fated) flipping a card and adding their relevant defense versus a static number. This can lead to a few head scratchers early on when odd interactions occur (for instance, remembering that FM characters receiving a + modifier to their attack actually results in the Fated character receiving a – to their defense flip) but, from experience, it usually takes about one game session for everyone to learn the ins and outs and get a feel for the mechanics. After that, everyone plays like a pro. The suits on the cards are used for triggers as previously mentioned or, in the case of spellcasting, are usually a required part of the Target Number for casting a spell. In the updated Core Rules, effort was made to tie each of the schools of magic (Sorcery, Prestidigitation, Illusion, and Necromancy) to one of the four suits and keep that consistent throughout, while at the same time reducing the number of effects which allow Fated to build a suit into their relevant skill and negate this cost early in their careers. So, no skill mastery as your first general talent to let you ignore the suits required for your spells, an overall positive change. This change leads me to recommend that most groups bring an Overseer, as its ability to discard Twist cards and add their suits to their party members’ Challenge flips can be huge early on. The Red and Black Jokers in the deck represent incredibly good or bad twists of fate, as per usual. The Red counts as a 14 with any suit, while the Black counts as a 0. If you flip the Red Joker out you may always use it, even if you have a negative modifier to your flip. If you flip out the Black, you have to use it even if you have a positive modifier. And, of course, if you flip both you have to use the Black, because this is Malifaux and Bad Things HappenTM. Damage also works the way it does on the tabletop. Characters’ attacks have 3 damage values, Weak, Moderate, and Severe, corresponding with the three ranges of cards (1-5 for weak, 6-10 for moderate, 11+ for severe.) After you make a successful attack flip you receive a modifier based on the amount by which you beat the opponents’ defense, flip cards, and the relevant fate card leads you to deal the damage. The Red Joker deals severe damage as well as an immediate critical effect (more on these in a moment) while the Black, as per usual, deals 0 damage (other than the crushing of your soul, of course.) Characters have a number of wounds that represents their ability to take and/or shrug off damage. Once they drop to 0 wounds, any additional damage they take results in an immediate Unconsciousness Challenge to avoid passing out and a flip on the Critical Effects table. Depending on the severity of the injury, these can result in as light of an effect as the character being rattled and incurring a minor reduction to any actions they take next time or as harsh as losing a limb or, eventually, their life. Any time you take damage past this point results in another flip on the Critical Effects table until, eventually, the character expires. Facilitating this, the tables themselves have been revised, compressing them and removing a number of the less impactful critical effects to make them really hurt when you suffer one. Since characters usually don’t have a ton of wounds to lose before these critical effects start happening, the end result is that combats in Through the Breach are quick, brutal, and vicious. It can still seem, at times, like some combat-oriented characters are nearly unkillable, particularly later in their careers. But then you run into the wrong group of opponents that match up poorly with their defenses, or you fight a lot of opponents with Black Blood or another passively damaging ability, or you just flip badly, and you find out how quickly things can go wrong in Malifaux. One of the things I like best about this game system is the use of Ongoing Skill Challenges. Most Challenges require only a single skill flip to resolve. However, larger activities like searching a library for a lost tome, crossing a desert, or presenting a case in a court room require a bit more of an extended effort. In these cases, you use an Ongoing challenge to represent this, introducing a list of skills that apply and giving a static target number to hit along with a number of successes required before a certain number of failures. If you succeed, the challenge is overcome and the Fated meet their goals. If they fail catastrophically, typically a consequence is introduced that they will need to overcome before the adventure can continue. This basic framework can serve in and of itself, but I find the best Ongoing Challenges involve modifications that crop up as the Fated go along. One of the most memorable Ongoing Challenges came from the first chapter of the Nythera event where the Fated get caught in the middle of a firefight between two Masters in Malifaux’s streets while trying to fetch the head of Phillip Tombers. After every round of action, a new complication would creep up (fireballs raining down from the sky on them, someone summoning ghostly spirits in their path, etc.) that would have to be overcome or taken advantage of before the Ongoing Challenge could progress. Between this and the combat rules, the game offers a variety of challenges for the Fated to overcome on the path of their destiny. Two opponents from the Bestiary. Oh, you don't have the core rules? Then you don't get to find out who they are! Ha ha! The final section includes the last of the tools required for the game, a Bestiary. Trying to cram a comprehensive bestiary for the world of Malifaux into 87 pages would be next to impossible, but the creatures provided do an admirable job of presenting a cross-section of the flora and fauna of that Fated characters will face, and if a particular critter from the tabletop game isn't in here yet, you can usually just use their stat card from the mini to at least pass as a Through the Breach creature. Representative creatures are presented for each of the seven factions so no matter what antagonist your campaign is built around, you can always find something to use for it. Additionally, the system of assigning models to their stations in life (peon, minion, enforcer, henchman, master, and tyrant) allows for built-in scalability of the bestiary contents. Have a game involving rogue spellcasters and enjoy Witchling Stalkers as enemies but not sure if they’ll be a challenge for your higher level players? Just increase them to Enforcers or higher and adjust their station accordingly. As Fatemaster Characters’ stations increase, so does the card they’re assumed to flip for every action, so all the things these new elite Witchlings do will scale up along with them. Additionally, to counter the disadvantage at which FM characters are placed due to not flipping cards or having a Twist Deck to cheat with, FM characters receive a certain number of Fate Points based on their station to spend to either give themselves a + modifier to a challenge, add in a suit of their choosing, or heal some damage, making fighting a Master or higher level opponent a truly intimidating proposition. Speaking of which, the final entry in the Bestiary is a master level character, Leopold Von Schill, leader of the Freikorps and general all-around badass. Included mostly, I think, to give a ball-park range for what Fatemasters should shoot for in the capabilities of other masters (though it’s not like an adventure where the Freikorps have a contract to take out one of your characters would be boring) it’s still nice to see the old man in action. And if you're thinking "But, I have Von Schill's stat card. Why would I need a new one?" Well, Mr. Smartypants...this Von Schill has a rifle. So there! But seriously, some of the mini game abilities don't translate well to the RPG every time, so it's usually worth the effort to redesign them slightly to iron out those wrinkles. After the Bestiary, the Core Rules contains a very short adventure meant to serve as an introduction to a game of Through the Breach. 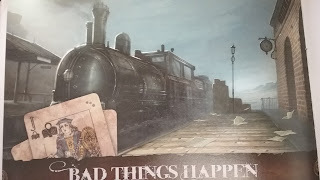 Fittingly, it features your characters doing just that: boarding the Iron Ram and travelling from Breachtown (built in what was Santa Fe until the first breach opened and destroyed it) to Malifaux. Of course this is a role-playing game so the Bad Things from the title of the adventure end up happening, and the Fated end up having to step in and save the train from getting stuck in the ether between the two worlds. As I said, it’s very short, and it features a skill challenge that, if failed, ends the adventure (and the career of your newly minted Fated characters) which is a personal pet peeve, but otherwise it’s a good introduction to the game and to the world of Malifaux itself. Through the Breach isn't always going to fit with every gaming group. I know of at least one local group in particular that likes the campaign world but chafes at how it lends itself to linear versus sandbox storytelling due to the idea of your characters’ destinies being spelled out at the beginning of the game (for clarity, you get a vague idea of the important events in your characters’ careers with the Tarot, but nothing says you have to go along with what Fate has in store for you when the time comes.) Some may find the system of flipping and adding in a skill and an attribute while remembering various Talents and building spells from Grimoires to be too complicated. Paradoxically, others may find the game to be too rules light, preferring a more tactically oriented system. What Through the Breach does have, however, is tons of character. Malifaux is a fantastic world in which to run a campaign, as I’ve previously effused. The diversity of the character options presented in the Core Rules makes it possible to build any character a player might want, honestly. The “heroes” are larger than life and characterful, and the “villains” are grotesque, stylish, and terrifying. It ranges through a number of different genres from steampunk to gothic horror to the Wild West, so it shouldn’t be tough to find something to pique your players’ interests. And the bottom line is, when you play Through the Breach it feels like you’re playing a Malifaux RPG. You’re flipping cards. The jokers and the suits are all there just like you expect. You’re cheating fate and trying to embrace or outrun your character’s destiny. I recommend it highly. The changes to the Core Rules are nothing but improvements, and my hat is off to the game designers for making the choice to keep everything backwards compatible so as not to invalidate previous Through the Breach publications. If you like Malifaux and you want to try an RPG set in the world, you enjoy episodic style storytelling, or you want to find a new RPG that plays differently than anything you've previously tried, I think this is the best way to do it. Some come join us Through the Breach!